A diary of life, alcohol, collies and attempting to keep fit. "for the happy, the sad, I don't want to be, another page in your diary"
I spend a lot of today getting in the mood for Sochi and watching the Olympics where we get our first medal. Jenny Jones takes bronze in the Snowboard Slopestyle. Suppose I ought to do my bit and we slope off to the gym for a workout. Where I hand in my Change 4 Life form to be cashed in after completing what I hope is a full year of gym and swim. Then we head to Broadway. 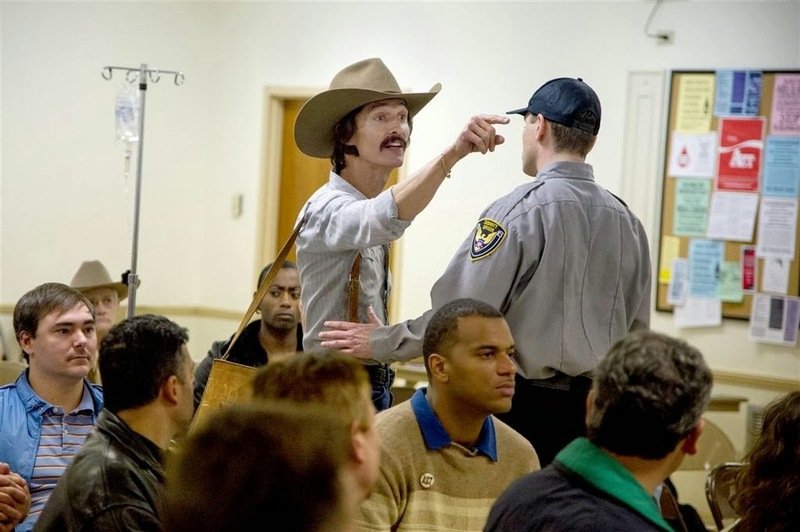 The Dallas Buyers Club is based on a true story. Dallas is rodeo country and winding back to 1985 we meet Ron Woodruff (Matthew McConaugnhey). A bit of a cowboy, a homophobic drug addicted alcoholic chain smoking womanising cowboy that is. After getting accidentally electrocuted at his job, Woodruff awakes up in hospital to be told bluntly that he is HIV+. Oh and that he’ll be dead in around thirty days. At first he doesn't believe the doctors because after all HIV is a virus that only homosexuals get and he certainly isn’t one of them. He's outraged that they seem to be branding him as one. That homophobia gets played back at him when his equally unenlightened friends find out he has the disease. When he calms down a tad he learns more about the disease and manages to illegally procure the drug AZT which is currently on trial. Then when his supply dries up he travels to Mexico in an attempt to get more. Once there a local physician Dr. Vass (Griffin Dunne) warns against AZT and instead tells him to stay healthy, take vitamins and recommends alternative drugs which are unapproved in the United States by the FDA (Food and Drug Administration). Once his own quality of life improves, he starts importing the drugs and sets up a business supplying them to other victims of the virus. He is assisted by a fellow HIV suffer he meets in hospital, Rayon (Jared Leto), a transgender male. Rayon initially disgusts Woodruff but through his disease he learns to have an open mind and they become good friends. The FDA is not impressed by their antics and tries to stop them. They only want to foist AZT on the world. So Woodruff ends up fighting the system and the big pharmaceutical companies. He quickly moves from being a man simply trying to survive, through realising he can make money from the situation to finally ending up on a moral crusade against the system. He even learns to sympathize with gay men, at least in regards to healthcare. It’s all rather excellent. McConaugnhey is great, sporting one of the scariest body transformations you’ll ever see. Leto is good too as is Jennifer Garner as Woodruff's Doctor. As for barely having a month to live, Woodruff ends up surviving nearly eight years. Any spelling mistakes or incorrect grammar is purely coincidental and in no way reflects the intelligence of the author.